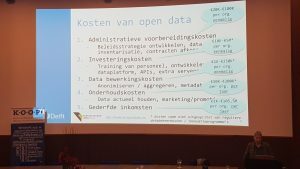 On Friday 15 December 2017, the Dutch Ministry of the Interior and Kingdom Relations (BZK) organised another ‘Data.overheid.nl’ User Meeting. Aim of these User Meetings is to allow users and providers of open data in the Netherlands to exchange ideas and experiences. More than one hundred participants attended the meeting in December. During this meeting, KCOD researcher Frederika Welle Donker presented the results of her research on the costs and benefits of open data. In her presentation, Frederika showed that costs of open data are different between organizations and between types of data. Benefits of open data mainly include efficiency gains, in both the public sector and in businesses. There are also societal benefits of open data, which, however, are difficult to measure. During the meeting, several other stakeholders of the Dutch open data ecosystem presented their work and ideas. Kevin Otjes and Elvin van Diermen showed how the Province of Zuid-Holland used the dataplatform.nl for mapping subsidies. Edwin Terink presented the latest developments of the open data developer portal of Schiphol. Erwin Mierlo (CBS) gave an update on the ‘Pilot Open Data Stelsel’. Frank Verschoor (Green Land) gave a talk on how open data fits into an organization. Marc Goossens showed the latest developments and open data applications of the ‘Boer en Bunder‘ platform. Sander Bakker and Antoine Gribnau gave an update on the ‘Praktijkbeproeving Open Data Standards‘.